Intel, AMD to kill the VGA Port! 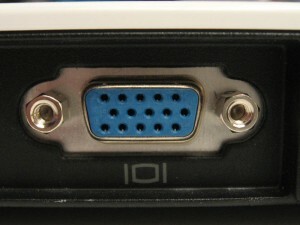 You can soon kiss your VGA port good bye! Intel and AMD have decided to kill the vulnerable VGA graphics port. The two chip makers came to the conclusion together with the help of Dell, Lenovo, Samsung, and LG in an industry wide agreement to phase out VGA entirely by 2015 and to make HDMI and DisplayPort the new standard. Intel plans to kill LVDS by 2013 followed by the VGA port by 2015. AMD is said to be following the similar time frame in phasing out the two technologies. AMD said that newer standards such as DisplayPort and HDMI provide the best connectivity options. The companies believe that DisplayPort 1.2 is the future interface for PC monitors along with HDMI 1.4a for TV connectivity. The ongoing push for 3D displays is partly the reason why VGA is being killed. TV panels require the latest HDMI spec to enjoy 3D TV which is being pushed by the gaming community. Sales of 3D TVs has been slow to pick up and some experts say that this is a desperate attempt by the industry to force the consumer to buy the latest technology by intentionally and deliberately killing an older technology that has worked flawlessly for the past 20 years.